Police have searched every vessel going into Poole Port - during a week-long operation addressing concerns about security. They searched 48 freight ferries and 14 individuals last week. Two illegal immigrants were detained. It follows Dorset Police and Crime Commissioner Martyn Underhill's calls for tighter security at the county's ports. After the operation, he said 'the big unknown is how many get through' and called for 'a commitment from Government' to do more. 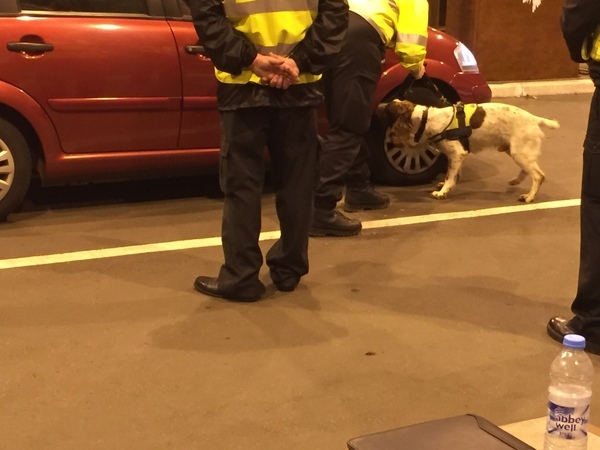 'The purpose of the operation was to deter, disrupt and detect exploitation of the Common Travel Area (CTA), general maritime (GM) and commercial maritime (CM) arena by those involved in criminality. 'It also acted as an opportunity for community engagement, to obtain intelligence and build working relationships with the maritime and aviation community. In total, 55 officers and staff were deployed to Poole Ports for the week, meeting every commercial maritime vessel that came in. The Marine Section rib and UK Border Force Cutter vessels assisted the operation. In total, 48 unaccompanied freight searches and 14 individual searches were conducted during the operation. Two vessels were boarded and nine people searched for drugs. Two illegal immigrants were detected during a search of a freight container and handed over to the UK Border Force for processing. In addition, two people were arrested during the operation, one for disqualified driving and the other for Breach of a Court Order. Gneral aviation sites, maritime sites and travel agents were also visited and briefed during the operation. "This operation has provided reassurance that the intelligence led approach we take in Dorset is effective. It has highlighted the importance of our continued vigilance around this kind of activity. "We are committed to working with our partner agencies and our maritime and aviation communities to build intelligence and keep our ports safe." "For the last year I have been campaigning for the Home Office to carry out a full review of small port security as I remain concerned that very little has been done to increase protection to our coastal borders. "During last week's maritime operation two illegal immigrants were detected during a search of a freight container in Poole. While I welcome the fact they have been detained on this side of the Channel, the big unknown is how many get through? "A recent report by the Chief Inspector of Borders and Immigration revealed a chaotic scenario with only three Border Force cutters defending our shores, an aerial capability that stopped months ago, and a team of maritime Border Force staff that received gradings of "poor" in 26 out of 27 areas concerning knowledge of threats and risks facing the UK. The Inspection reveals clear confusion and lack of direction. This is an absolute scandal. "I want to see a commitment from Government to improve our existing security measures. Unless we act now, the effects of having poor or insufficient security on our coastal borders could be disastrous. We live in dangerous times and we are only as strong as our weakest link. It is quite clear that small ports are the weakest link." Dorset Police ask that the public continue to support their work by passing any information to them online at www.dorset.police.uk, via the 101 non-emergency number, or by calling Crimestoppers anonymously.